The debate over United States and European Union-led sanctions against doing business in Myanmar is set to intensify in the wake of US Senator Jim Webb's recent high-profile meeting with Senior General Than Shwe and detained pro-democracy leader Aung San Suu Kyi. 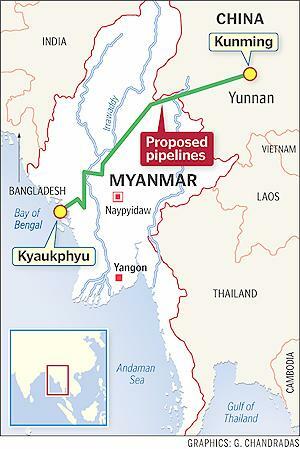 Webb spoke out against the sanctions and Myanmar's junta echoed that call through state media. As US policymakers weigh the pros and cons of economically re-engaging the ruling junta, the process will necessarily take into account that a handful of military linked businessmen, many allegedly involved in illegal activities, including drug trafficking, dominate Myanmar's underdeveloped economy. A Myanmar gas consortium led by South Korea's Daewoo International plans to invest about $US5.6 billion in a 30-year natural gas supply deal with China, a member of the group has said. Under the agreement, the consortium will sell natural gas to China's top state oil and gas firm, China National Petroleum Corp (CNPC), from the Shwe and ShwePhyu fields in Burma's A-1 offshore block and Mya field in A-3 offshore block, starting from 2013. Daewoo has a 51 per cent stake in the consortium and the other shareholders are India's Oil and Natural Gas Corp with 17 per cent, Burma Oil & GAs Enterprise with 15 per cent, India's GAIL with 8.5 per cent, and Korea Gas Corp with 8.5 per cent.